May 16, 2015, 11:36 AM · The Walt Disney Company is preparing to kick off this week its celebration of the 60th birthday of its flagship theme park, Disneyland. The Diamond Celebration officially starts with a 24-hour party at the Disneyland and Disney California Adventure theme parks this Friday. The resort will preview its 60th anniversary fireworks, parade, and World of Color show for invited guests earlier this week, and we will have previews and reviews of the shows here on Theme Park Insider for you throughout the week. 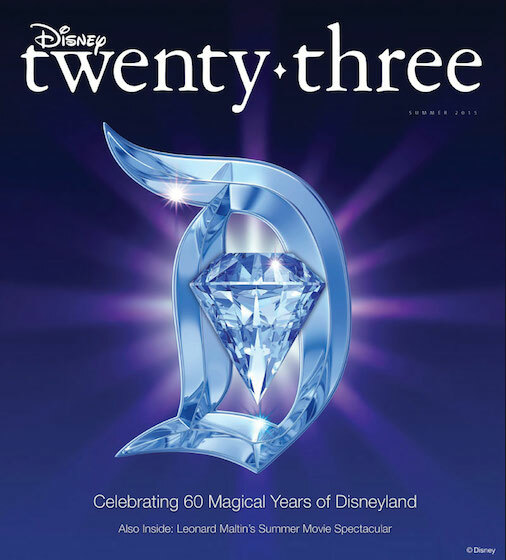 Disney has announced that the summer issue of its D23 fan club magazine will honor the Disneyland 60th celebration. The issue will feature current and former Walt Disney Imagineering leaders Bruce Vaughn and Marty Sklar walking through Walt's original park, talking about the park's history, legacy, and future. The issue also will include photos of Disneyland icons and memorabilia from the Walt Disney Archives. The D23 magazine is available to Gold Members of the Disney fan club. May 16, 2015 at 2:13 PM · Impressed by the live ABC broadcast. That was a big failure when they held the 50th, especially as the original broadcast was an iconic event for both Disney and ABC 50 years before. I remember a friend, not a big Disney or theme park fan asking me, "isn't it [50th] going to be on TV?" Oh, how those over 30 can recall many, many Disney World and Disneyland TV anniversary and launch specials. Perhaps Disney/ABC was reminded of some old tricks from NBC's Harry Potter special? 1. Omg so excited can't wait!!! 2. Headin' on over to SoCal/Orlando this summer with my family! First time goin' there in years, so really excited to see some new stuff! 4. Oh, Universal is so much better because they actually listen to their fans and produce cutting-edge attractions almost every year while Disney takes forevor to build one attraction! 5. Universal? Are you kidding me? Disney is obviously superior because they have much greater variety! Why do they take so long? To make everything perfect, that's why! 6. "(Quote from earlier comment)"
Actually, that's not entirely true. So-and-so actually came before so-and-so. May 17, 2015 at 2:35 PM · So if the video is right, Soaring reopened? Any changes? May 18, 2015 at 8:09 AM · Not sure how a broadcast is live if you don't see it until next year.